The former Police front man is touring with the Royal Philharmonic Concert Orchestra. Unlike his former band's reunion tour, he is enjoying himself. Reporting from New York - As the afternoon sun poured through the living room window of his grand apartment overlooking Central Park, Sting was calmly reflecting on his trying reunion with the Police, and anticipating, with genuine excitement, his current tour with the Royal Philharmonic Concert Orchestra, performing imaginative new versions of his solo and Police hits. Sitting on a stately sofa with his back to the window, shadowed by the park's round green elm trees, the 58-year-old musician was the picture of the artist in repose. 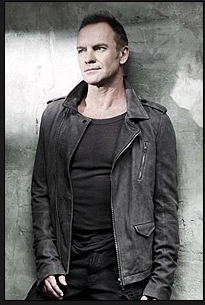 If Sting could appear glib when he was younger, he came across on this late April day, looking fit as an athlete, in gray running pants and V-neck white T-shirt, as genial and likable. Not that his yoga mellowness has drained him of strong opinions. During his darkest hours on the road in 2007 and 2008 with Police mates Stewart Copeland and Andy Summers, Sting admitted he felt sick. "It was like going back to a dysfunctional marriage," he said. "Before the tour I asked myself, 'What should I do next? What would surprise people? What would surprise me?' One voice said, 'The biggest surprise you could throw right now is to re-form the Police.' Then another voice goes, 'No, no, don't do it!' "
What sickened him about the tour? "It was an exercise in nostalgia," he said. "And I'm not a terribly nostalgic person. It just seemed like an asset that needed to be realized. I have no regrets at all. But it was difficult. It was not a marriage made in heaven." According to Forbes, the tour allowed Sting and band mates to realize a net asset of 5 million. It may seem like a contradiction, then, that Sting is mining his past songs for his current tour, which began last week in Vancouver, Canada, and continues next week at the Hollywood Bowl and Verizon Wireless Amphitheater in Irvine. But that's not how he sees it. Playing 'King of Pain', for instance, with an orchestra, liberates the song from its Police incarnation. "The song becomes new," he said. "Of course, writing new songs would be nice. But the old songs need to be kept alive, need to be regenerated, with new life blown into them. With an orchestra, a pallet that large, you can literally re-create everything. The whole of my 120 songs, or however many songs I've written, seems available. I'm intrigued to hear them all this way." Watching Sting rehearse is a reminder of what a fine musician he is. In April in a New York studio, he bopped around on a stool and offered musical cues to dynamic New York-bred conductor Steven Mercurio and a contingent of classical players, many of whom performed with the Metropolitan Opera and New York Philharmonic. Previously Sting had sent his songs to a host of arrangers, granting them creative carte blanche to reanimate the melodies, harmonies and beats with the strings, woodwinds and brass instruments of the orchestra. Once Sting was satisfied with each of the arrangements, which were worked out in rehearsal with the New York musicians, the final scores would be issued to London's Royal Philharmonic, which Mercurio is conducting on tour. Just now the New York players were running through 'Russians' from Sting's first solo album, 'The Dream of the Blue Turtles'. Sting sang softly - a long day of rehearsal and an allergy had taken a toll on his voice - and accompanying singer, Jo Lawry, an Australian with a warm and alluring tone, carried the lyrics with wit and passion. Mercurio had the idea to preface Vince Mendoza's stirring arrangement with the clamorous coronation scene from Mussorgsky's 'Boris Godunov', which granted the song a wonderfully ominous Russian setting. Which was fitting, as Sting originally crafted the song on a theme from Prokofiev's 'Lieutenant Kije Suite'. Sting sipped tea at the song's conclusion. "Can you hold the last two notes on the trumpet?" he asked the horn player. Sting sang the notes with sustain. "It's much more lyrical that way." For orchestra, Tescari remade the song as a Kurt Weill dirge, punctuated by a woozy Day of the Dead marching band. Sting clearly enjoyed singing the new arrangement and ended with a long wolf howl. Some of the orchestra members applauded. Still, said Mercurio, the song "needs to be more 'horror movie.'" "Can we get a thunder machine?" Sting asked. "Perfect," said Mercurio. A thunder machine is a long sheet of metal that when shook makes the sound of spooky thunder. During a rehearsal break, Mercurio said he canceled his summer performances of 'Rigoletto' with Rome's Teatro L'Opera. "Conduct with Sting? It was such a rare chance that I couldn't pass it up," he said. Mercurio has conducted many of the world's best orchestras and recorded with Andrea Bocelli and Chick Corea. The key to the Sting concerts, he explained, was ensuring "the orchestra is not just humming along in neutral, playing whole notes behind pop tunes." Just then music supervisor Rob Mathes, who had been noting the score changes, and who arranged Police rockers like 'Next to You' for the tour, joined the conversation. "Whenever there's something in the charts that's cheesy, Steven looks at me and goes, 'That's a little Velveeta.' "Mercurio laughed. "But we're editing all that frilly stuff out," Mathes said. "We don't want to sound like a Pops concert." Back in his apartment, Sting said he conceived this tour, called 'Symphonicity', after feeling inspired by performing a set of his songs with the Chicago Symphony Orchestra in 2009. The orchestra had invited him to perform a private concert for its corporate benefactors. Two major donors, billionaire hedge-fund managers, had requested Sting. Sting has been a fan of classical music since he first started playing rock and jazz in his hometown of Newcastle, England, in the '70s. In part, he explained, he recorded 2006's 'Songs From the Labyrinth', a collection of ballads by Elizabethan lutenist John Dowland, and 2009's 'If on a Winter's Night', a set of beautifully played carols and reconfigured tunes by Bach and Schubert, to honor his native land and musical ancestry. But, he offered with a touch of humility about his current project, "We're not doing here classical music here. We're making orchestral music out of pop music. And that's a different thing." A studio recording of 'Symphonicity' will be released this July. Still, Sting relished the idea of crossing genres and exploding the strictures of rock. "I can't imagine a more conservative music than rock 'n' roll," he said. "It's tyranny in the backbeat. It's 4/4 time. It's the same three chords 'round and 'round. It's almost like a fundamentalist religion. Stravinsky is more rebellious than rock 'n' roll by far. Rock 'n' roll has become like a dead art." The criticism Sting's endured over his long career for weaving jazz or Algerian music into rock has only inspired him. "People want to keep you in the box they've given you," he said. "It's a tribal consciousness. Stay in your class. Stay in your country. Because if you move you're trouble. But the fact is, that volatile molecule is the one that transforms everything for the better. So I think it's always worth doing."